Rum Barrel Saison | Woxford Brewing Co.
Steppiing up generation 2 of Gigayeast Saison II from gen1 yeast cake with hops. It’s time that I brewed a second beer to put into the clean Rum Barrel I picked up at the beginning of the year. It currently has v5 of Makkurokurosuke RIS. I’m extremely excited for this one. All of the barrel-aged RIS have been phenomenal, this one won’t be anything less. Before I can rack the RIS I need to have a replacement beer brewed to minimize the amount of time that the barrel remains empty. In the previous barrel, I cleaned it out and filled it with vodka. While that worked out just fine I don’t want to waste any time since I need to get a 3rd beer in and out before this Winter when I’ll brew a second batch of Woxbic, the Woxford lambic-style beer. I struggled with what exactly to put into a 11 gallon Rum barrel. Previously I’ve brewed a Strong Scotch and a Robust Porter for whiskey barrel. I’ve also put a barleywine and shortly a Belgian Quad, so I was looking for something a bit different. I started thinking about what flavors go well with Rum and several mixed drinks came to mind. I’m not much of a liquor drinker, but when I did dabble, I really enjoyed Rum and Coke and Rum with Orange Juice; a screwdriver if Google is to be believed. I really liked the idea of mixing fruity hops with rum and then a solid dry beer finish. 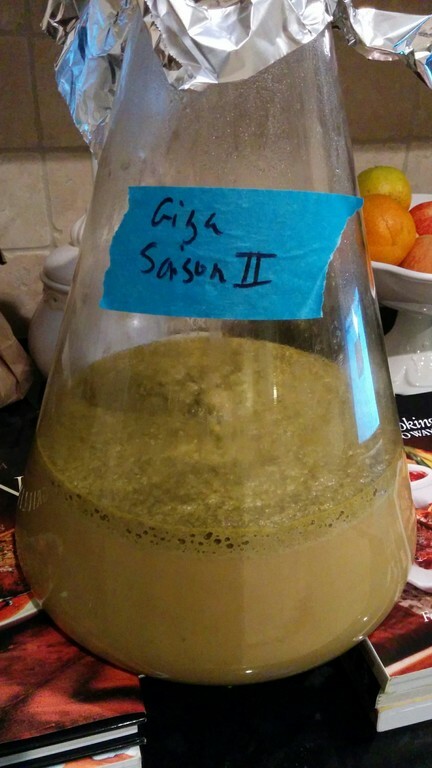 It also helped that I had a large slurry of Gigayeast Saison II from my last saison. This will be the same grain bill (but bigger) as for Tajín, but with a few choice hop replacements to really focus on citrus, fruit and spice. I used Summer in previous which came out really nice. I swapped Fuggle for Willamette as I was out and still wanted some earthy, spice. Meridian is fruit gold so I wanted some of that. Galaxy is another really fruity flavor. Finally, some Apollo for that orange, tangerine citrus. This should ferment out cleaning in less than a month after which I’ll rack and bottle the RIS and add this beer into the rum barrel for a month or so. It’s a lighter beer which means it won’t take as much contact time to pull in the rum flavors. This entry was posted in Barrel Aged, Beer, Recipe by funkmetal. Bookmark the permalink. Pingback: Tasting: Dai Tajín | Woxford Brewing Co.